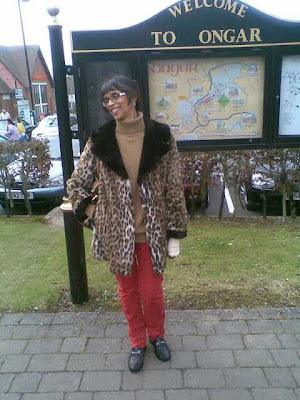 Whilst on my travels this weekend, I thought I'd combine my two current favourite trends-leopardprint and red jeans. After seeing the gorgeous Wendy's post on Inspirational Ladies in Red, I thought I would wear mine to show solidarity of the red leg brigade. Its a very popular look of the moment, the lovely Kate is doing Red Legs Too and wonderful Mrs TNMA also debated on Red Hot, or Not? I suppose it really is much like marmite-you either love this trend-or not!! As my red jeans by H&M were thrifted a few weeks ago at the boot sale for only £2, I felt I wasn't really losing out too much if after a couple of wears I didn't feel right in them. The fit of them are a skinny straight leg and although I will wear them as part of a winter/spring look, I think I'll feel more stylish wearing them in summer with a striped tee and ballet pumps. 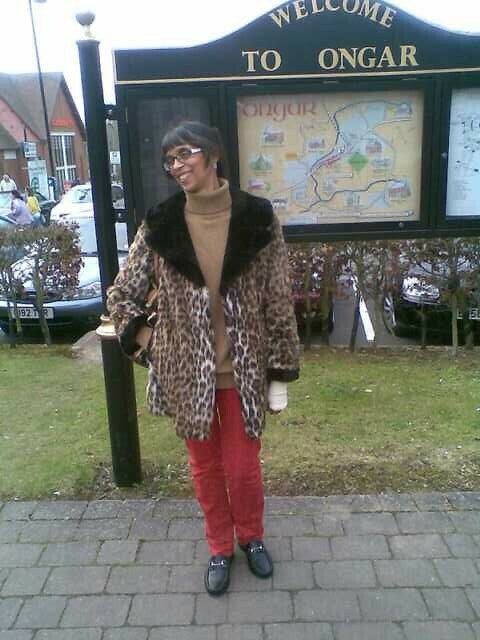 H&M red jeans from the boot sale, faux fur vintage leopardprint coat, Uniqlo camel wool sweater from the boot sale, Gucci black loafers, gifted Louis Vuitton holdall. It didn't stop me from finding some pieces for my new vintage Etsy shop though-I've still got some work to do before the launch in April, but can't wait!! I hope you all have a stress free and pain free relaxing Sunday!! I'm adding you to a new red-leg post! 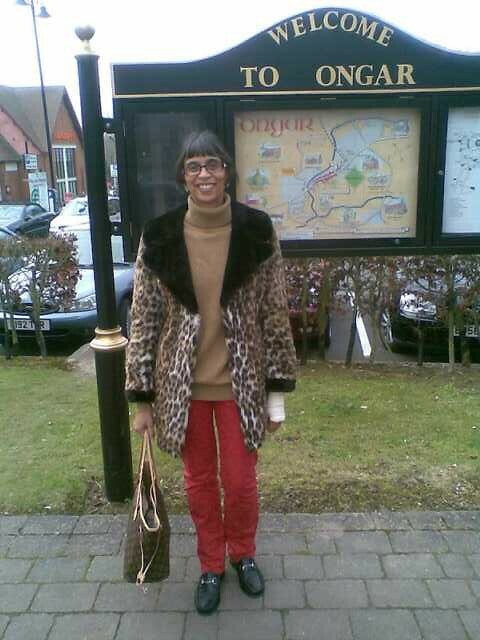 Dear Sharon, I love red and leopard together. It's a great look. I love your look but think you should drop the 'thrifted'....far too American! I am sorry to hear about your hand, dear Sharon! Get better soon! My dear Sharon, you are my thrifting hero, just one hand, and still manage to get wonderful finds. Enjoy your Sunday, my friend. Thanks for the mention - still haven't found a pair of red jeans yet! I tried some on in Zara but they were too tight and they didn't have a larger size. So I'm still on the look-out. Yours look great - another fab find. They look brilliant with the camel and leopard print. Sorry to hear about your hand Hun. Sending loads of best wishes your way. I love your red jeans. I tried some bright blue ones on this weekend, was very tempted. Ugh, I'm sorry about your hand. Hope the pain goes away soon! I'm in love with your leopard look! Also think you pull off the red jeans perfectly. Don't know if I could do the red legs, because it reminds me too much of a professor I had in uni (he was notorious for running around in red jeans. And he was an idiot.) But I do love it on others, so maybe I should reconsider. Sharon, you look so lovely; because of the outfit and because of your smile!!! Love the combination of red, beige and the Gucci black loafers. I hope you hand gets better soon and have a great coming week!! I love red legs, but haven't found the right ones yet. Gotta keep looking... Yours are great, Sharon! It's SO right on you! And the red dress in your previous post is SO beautiful. I join the others in wishing you a quick and complete healing of your wrist. We're relaxing and getting ready to take care of 4 grandchildren tomorrow through Wednesday. I'm glad my husband is able to help me since my knees are in quite a bit of pain from hiking some irregular trails last week! I will recover. Ouch, you poor thing. Get well soon. At least you're looking fab: those red jeans suit you fantastically. Mmmmm i love the red legs too. Especially teamed with this print. Very isabel marant! You look fantastic! Sadly I sold my red zara jeans I bought in Spain about 4 years ago on ebay and am regretting it! I am still drooling over the coat! Love the leopard print jacket, what a cool find. I'm on the hunt for something similar. Looking good!